Nearly a decade ago, researchers discovered a quirk of human genetics: people with a certain haplotype allele—found in about 15 percent of the population—of the gene for GTP cyclohydroxylase 1 enzyme (GCH1), an enzyme required in a pathway through which a co-factor important for neurotransmitter synthesis is produced, experienced less pain after discectomy surgery than people with the more common form of the gene (Tegeder et al., 2006). New research from the same group, co-led by Michael Costigan and Clifford Woolf, Boston Children’s Hospital and Harvard Medical School, Boston, US, now shows that GCH1 activity in both injured sensory neurons and macrophages contributes to neuropathic pain sensitivity in mice, and systemic treatment with a novel inhibitor of the pathway alleviated pain without adverse effects, revealing a promising target for new drugs aimed at neuropathic pain. “Since the 2006 publication of the pain-protective haplotype, several groups—including ours—have been obsessed with finding an explanation for this analgesic effect,” said Lisbeth Birk Møller, Copenhagen University Hospital, Denmark, who was not involved in the current work. Investigators have made strides toward that explanation, but “in the present paper, the researchers made elegant use of transgenic mice to pinpoint in a very sophisticated way the influence of GCH1 on pain in a much more detailed manner,” she said. GCH1 is required for synthesis of (6R)-L-erythro-5,6,7,8-tetrahydrobiopterin (BH4), a critical co-factor in the synthesis of neurotransmitters including dopamine, serotonin, epinephrine, norepinephrine, and nitric oxide. Previous studies had shown that elevated BH4 levels increased sensory nerve activity and pain hypersensitivity in rats, suggesting that lowering BH4 might be a strategy to normalize pain hypersensitivity (Latremoliere and Costigan, 2011). In the new study, first author Alban Latremoliere and colleagues used transgenic reporter mice expressing green fluorescent protein (GFP) under control of the Gch1 promoter to show that, a week after spared nerve injury (SNI), GCH1 was upregulated in axons and cell bodies of myelinated and unmyelinated dorsal root ganglia (DRG) neurons. But GCH1 was found in other cells as well. In those experiments, Latremoliere said, “we saw this beautiful stellar pattern of staining—cells lit up like stars across a night sky—and we realized there was another cell type producing GCH1—not just sensory neurons.” Indeed, staining for the marker protein CD68 showed that GCH1 was upregulated in macrophages within injured nerves. “We never expected that,” he said. Aside from de novo production by GCH1, BH4 can also be recycled and scavenged within the cell. After nerve injury in the mice, the researchers found increased production of enzymes in those alternative pathways, contributing to increased BH4 levels in nerves and immune cells. To further understand the role of BH4 in pain, the team wanted to determine whether increased BH4 levels alone would make mice without nerve injury more sensitive to pain, so they created transgenic animals that overexpressed GCH1—and therefore BH4—exclusively in sensory neurons. “We saw a heat sensitivity phenotype in those non-injured mice that depended specifically on nitric oxide synthesis,” Costigan said. Next, the authors tested the opposite—whether loss of GCH1 would attenuate neuropathic pain sensitivity in injured mice—using transgenic animals that lacked GCH1 specifically in sensory neurons. Heat and mechanical sensitivity were unaffected in non-injured mice, indicating that GCH1 was not required for acute, nociceptive pain. But after nerve injury, mice lacking GCH1 in sensory neurons displayed higher mechanical withdrawal thresholds than their wild-type counterparts, whereas cold sensitivity was unaffected. To test whether loss of GCH1 from sensory neurons could reduce established neuropathic pain, the researchers made inducible gene knockout mice in which tamoxifen treatment turned off GCH1 expression. After nerve injury, the mice developed mechanical hypersensitivity as expected, and pain sensitivity was reduced after tamoxifen treatment. Although those transgenic mice no longer produced GCH1 in sensory neurons, the authors still saw evidence of GCH1 activity and the presence of BH4 in the nerves, suggesting that macrophages were a major source of BH4 after nerve injury. Because they believed BH4 was the pain-sensitizing agent, the researchers next took a pharmacological approach to reduce the remaining BH4 production by immune cells. But targeting GCH1 activity itself throughout the body would stop production of BH4 altogether—and with it, neurotransmitters. “The last thing you would want to do is to exhaustively inhibit GCH1 systemically—this would lead to all kinds of problems,” said Costigan. Instead, Costigan said, they considered the BH4 pathway very carefully and decided to target sepiapterin reductase (SPR), the terminal enzyme in the de novo BH4 production pathway. 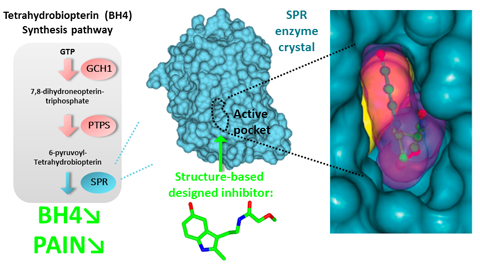 Unlike inhibition of GCH1, which effectively halts BH4 synthesis—and neurotransmitter production—blocking SPR activity still allows for limited production of BH4 through its scavenger pathway, thereby preventing a crash in the critical cofactor. Sulfasalazine (SSZ), a known, Food and Drug Administration (FDA)-approved anti-inflammatory agent, was recently found to work by inhibiting SPR (Haruki et al., 2013), so the authors tested SSZ in nerve-injured mice. They delivered SSZ by gavage—so that the drug could be metabolized into a soluble form by gut microbiota—and found that it reduced mechanical pain sensitivity significantly for two hours. In an effort to improve on that inhibition, the authors designed a new inhibitor of SPR that they called SPRi3, which tightly bound human SPR in vitro and reduced SPR activity in primary cultures of mouse sensory neurons. In nerve-injured mice, intraperitoneal injection of SPRi3 reduced mechanical allodynia without affecting nociceptive responses in naïve mice. SPRi3 treatment also reduced mechanical allodynia several weeks after nerve injury, suggesting that BH4 production contributes to ongoing pain states. Did SPRi3 reduce pain by targeting SPR solely in sensory neurons, or in immune cells as well? To answer that question, the authors examined mice that lacked GCH1 only in sensory neurons, which already displayed reduced neuropathic pain sensitivity. SPRi3 treatment further reduced mechanical sensitivity in those mice, indicating that SPRi3 also affected macrophage function, the other cell type to produce BH4 in injured nerves. Purified, activated macrophages treated with SPRi3 reduced their production of the pain signal nitric oxide (NO) but not pro-inflammatory interleukins, suggesting that macrophage production of BH4 contributes to pain hypersensitivity after nerve injury through NO. Because SPRi3 reduced macrophages’ contribution to pain hypersensitivity, the researchers also tested SPRi3 in an inflammatory pain model. After injecting the GCH1 fluorescent protein reporter mice in the paw with complete Freund’s adjuvant (CFA), the investigators saw infiltration by macrophages that expressed GCH1. Treatment with SPRi3 reduced inflammation-induced thermal hyperalgesia but did not affect mechanical allodynia. The drug was similarly effective in mice lacking GCH1 only in sensory neurons, suggesting that macrophage-derived BH4 drives the inflammatory pain state in the CFA model. SPRi3 also improved pain sensitivity in a model of rheumatoid arthritis in which mice were injected with CFA in the knee joint. In a great stroke of luck, SPRi3 came with a built-in biomarker of its inhibition of SPR. Normally, SPR carries out chemical reduction of sepiapterin, a byproduct of BH4 production. But when SPR is inhibited, sepiapterin accumulates in tissues. SPRi3 treatment in mice led to sepiapterin elevation in plasma, indicating the SPR target had been engaged and inhibited by the new drug. In the nerve-injured mice, SPRi3 was detected in peripheral nerves and in the DRG, where BH4 production was decreased and sepiapterin levels rose, indicating the drug had inhibited SPR there. Importantly, the drug did not cause detectable adverse effects or tolerance in treated animals, nor did it impair animals’ performance on behavioral tests meant to detect diminished production of dopamine or serotonin, hinting that a similar agent might also be safe in humans. Although this work makes major advances toward understanding how BH4 influences pain, questions remain. For example, recent work from Møller and colleagues showed that BH4 injected into the paw caused acute pain behavior in normal mice (Nasser et al., 2015). BH4 itself did not cause inflammation, and the nocifensive response did not depend on prostaglandin, nitric oxide synthase, or transient receptor potential vanilloid type 1 (TRPV1). “We do not know how BH4 directly affects neurons, but the effect we observed was very fast—within five minutes or less after injection—so we assume that it is independent of gene regulation or new protein synthesis,” said Møller. “This work was meant to test the mechanisms in the pathway, but one day a drug will be designed to target BH4 that will work in humans,” Costigan said of the new study. SPRi3 itself will not be suitable for use in humans, mostly for reasons related to its solubility and pharmacokinetics, but a biotechnology company co-founded by Woolf called Quartet Medicine is pursuing development of agents to safely reduce BH4 levels in people with chronic inflammation or neuropathic pain. Latremoliere A, Latini A, Andrews N, Cronin SJ, Fujita M, Gorska K, Hovius R, Romero C, Chuaiphichai S, Painter M, Miracca G, Babaniyi O, Remor A P, Duong K, Riva P, Barrett LB, Ferreirós N, Naylor A, Penninger JM, Tegeder I, et al. Neuron. 2015 Jun 17; 86(6):1393-406. Intraplantar injection of tetrahydrobiopterin induces nociception in mice.